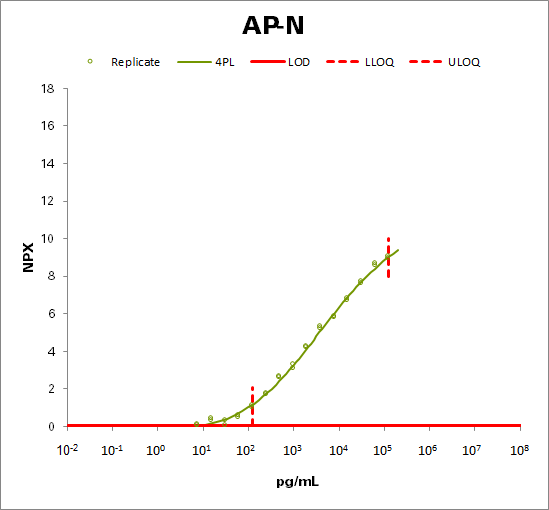 AP-N is a broad specificity aminopeptidase. It may play a critical role in the pathogenesis of cholesterol gallstone disease, and may be involved in the metabolism of regulatory peptides of diverse cell types, such as angiotensin III and IV, neuropeptides, and chemokines. It is found to cleave antigen peptides bound to major histocompatibility complex class II molecules of presenting cells and to degrade neurotransmitters at synaptic junctions. Furthermore, it is s implicated as a regulator of IL-8 bioavailability in the endometrium, and therefore may contribute to the regulation of angiogenesis. AP-N is used as a biomarker for acute myeloid leukemia and plays a role in tumor invasion, as well as used as a biomarker?to detect damage to the?kidneys, and may also be used to help diagnose certain?kidney disorders. AP-N also mediates cytomegalovirus (HCMV) infection.